Columbia 2014. Photo: Dave Ammenti. Join us for the 12th Annual Northern California GlaStar/Sportsman Fly-in on Oct. 3-5 in Columbia, California! 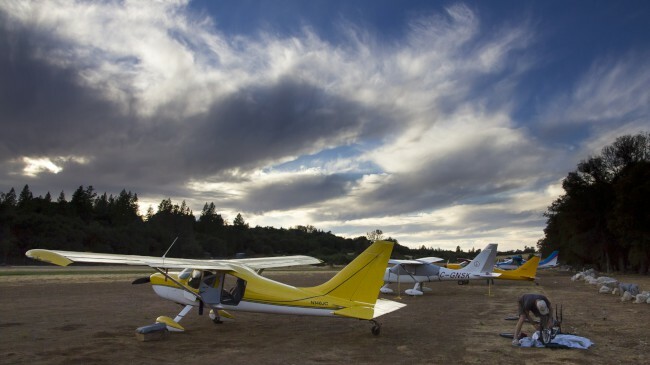 This fine fall fly-in takes place at one of California’s nicest public fly-in facilities. Beautiful examples of our favorite aircraft will gather on the flight line, we’ll talk shop, walk to the old gold mining town, and potluck together. On Saturday, some may fly to nearby Pine Mountain Lake for airport day while others may visit the Giant Sequoias. Wear your favorite flying t-shirt to our Saturday evening potluck! There will be prizes for funniest, oldest, and best homebuilt t-shirt. Columbia 2014. Photo: Arlo Reeves.